NZ could be the country of Rainbows. Who doesn’t remember this brave little country standing up to the world against the Nuclear tests and ships entering their waters in the mid-Eighties? Protests were big in the Netherlands against Nuclear bombs at the time, and here was a country that as a whole had said ‘no’. The sinking of the Greenpeace ship Rainbow Warrior by the French secret service was a sad event for NZ and had a big impact on NZ thinking. Suddenly NZ woke up and realised they needed to protect their rainbows themselves. Not with allies from the past, but with those who see the same rainbows in the South Pacific. This blue episode is certainly not forgotten, but New Zealanders wouldn’t be what they are, if they hadn’t moved on. The Rainbow Warrior was re-sunk to become a beautiful diving site of the coast of Northland. The French tourists are welcomed with open arms and French markets are really popular. 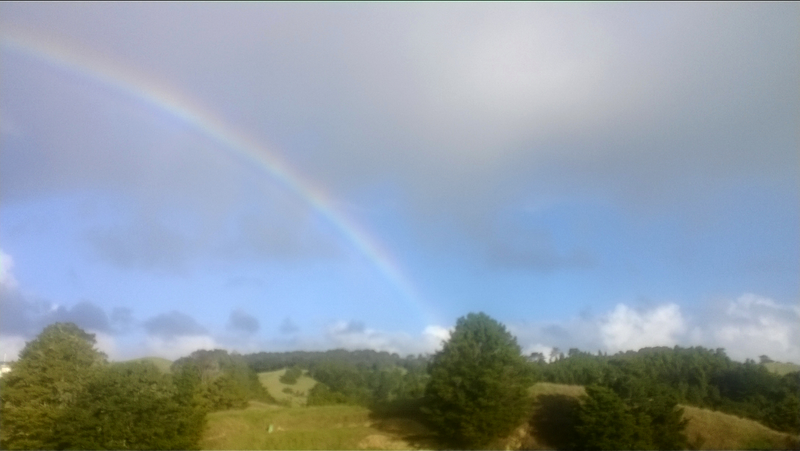 Rainbows in New Zealand are stunning. Before I got here I had never seen a full rainbow, seeing where it touches land on two sides, let alone a double rainbow. Here you often see them. I can see why legend would put a pot of gold at the end of it. Rainbows give hope. They are certainly not meant to be warriors. This entry was posted in A to Z challenge and tagged a to z, french, hope, new zealand, Rainbow warrior, Rainbows. Bookmark the permalink. We love nuclear free, smoke free will be Kiwi’s next goal. yes indeed! by 2025 isn’t it? Smoke free is hard, because govt will loss tax. The benefit of smoke free is not obvious in half century.Heavy tobacco excise duty is the solution, same as in Scandinavia countries.